On Wednesday, the organizers of the Women’s March — the worldwide protest to advocate for gender equality, diversity and inclusion — are challenging us to consider what a day without a woman would be like. I can tell you the value that women bring to Cal State San Marcos. In fact, over 60 percent of our student body is female. While this is not different from the national norm — the U.S. Census Bureau reported in 2015 that for the first time women were more likely than men to have a bachelor’s degree — there is a disheartening truth that belies these numbers. According to the Institute for Women’s Policy Research, women are obtaining more education but still waiting for equal pay and equal opportunities for leadership. Women with bachelor’s degrees make an average of $50,000 a year — the same average earnings as a man with only an associate’s degree. As the first woman to hold the position of senior president in the 23-campus California State University system, I have seen gender inequities in positions of power firsthand — even in 2017 it is difficult to be judged as both a good woman and a good leader. Now in my 22nd year as a university president, I hope that my path can serve as an inspiration for other women. It is especially important given that only one in four college presidents is a woman, a number that has remained largely the same for over 20 years. At Cal State San Marcos, I am proud of how we have worked to cultivate a campus culture that is committed to diversity, educational equity and social justice. We try to model these principles in the makeup of our community — not only are the majority of our students women, but more than 50 percent of our tenure-track faculty members are women. Three of our five vice presidents are women, and half of our academic deans are, too. Furthermore, a large percentage of our associate deans and associate vice presidents are women — in fact our Director of Athletics and Director of Veterans Services are women as well! I am proud of the work we have done, and continue to do, to ensure that Cal State San Marcos is a place for us all to realize our full potential and possibilities together. I also realize that in order to lead, we must continue to be purposeful in our efforts to continue to promote equity and inclusion on our campus and in our society. We can’t change what we don’t talk about or see, so on A Day Without Women I will wear red in solidarity with women and our allies around the globe. I hope you will join me. Wear red, continue the conversation, pay attention to gender bias and notice the presence — or absence — of women around you. Gender equality not only means more women in positions of leadership, it means a reduction in poverty, an increase in economic growth and more solutions to pressing issues through a diversity of thoughts and experiences. Gender equality isn’t just good for women — it’s good for everyone. 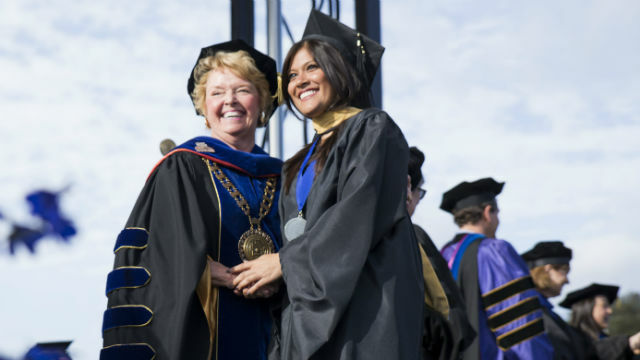 Dr. Karen S. Haynes is president of California State University San Marcos. She is the first female senior president in the 23-campus California State University system.